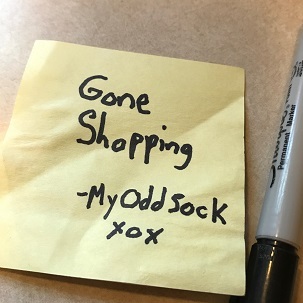 Time to hit the stores for a little shopping. My Odd Sock style, of course. Grab your charge card and let’s see what we find…..
Whoa, a whole stack of Squatty Pottys! The maker is so certain the Squatty Potty will help you, they have a money-back guarantee. You get a full refund and well, eh, just keep the Squatty Potty too because no one wants a used one. 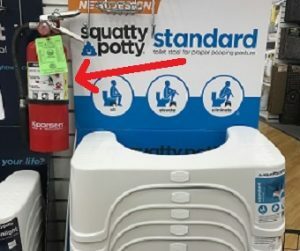 If you must keep a fire extinguisher next to your Squatty Potty, maybe you should lay off the spicy stuff next time. 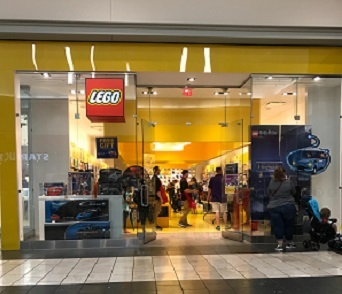 Here’s the Lego store at the mall. It’s the only store where you definitely need to wear shoes. No shirt. No shoes–just don’t blame us if you step on a loose Lego. Flashy is just my style. 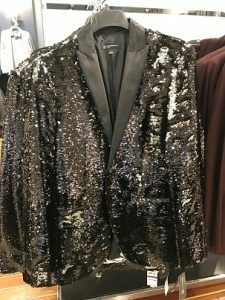 Nice jacket from Macy’s for the next time I sing with The O’Jays. This just doesn’t seem right. 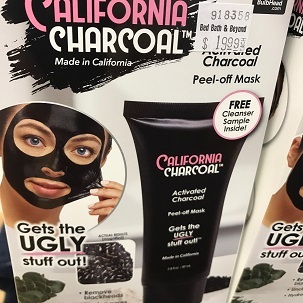 I thought black-face went out with Vaudeville? 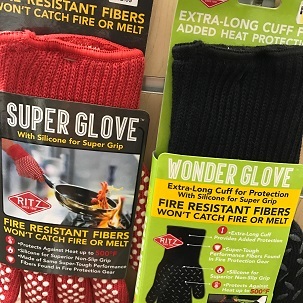 Super Glove or Wonder Glove…how do you decide? Which adjective do you prefer? These sound like something from a Marvel movie. Fire resistant fibers are a super power from a galaxy far far away. Poor pumpkins all locked up. 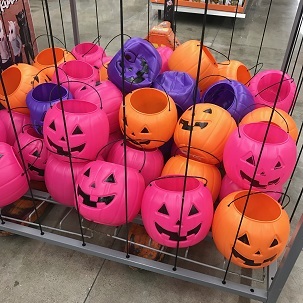 I noticed this display of a halloween pumpkin prison. The way they are all penned up, sorta reminds me of Trump’s illegal aliens in New Mexico. A hat for all heads. 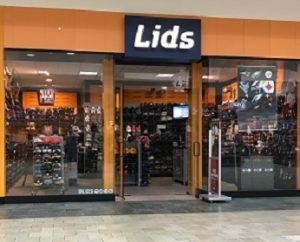 Lids has hundreds of hats. Do you think I could find one nice fedora? Is it a deodorant? Sunscreen? Stain fighter? Moisturizer? Wart remover? What is it? 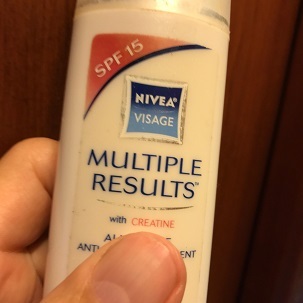 Nivea is so vague on its use THEY don’t even know what to call it. Worse yet, how does the store know what shelf to put it on? Finally, if Nivea can’t define its proper use–why would anyone want to put it on their face? Feather boas on the comeback? Hey now, here’s a mannequin that knows how to model underwear! Wear it or wash with it? 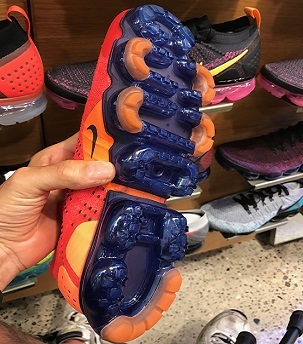 Introducing new Nike Tide Pod running shoes. That’s enough shopping for me. I’m beat. Save your receipts for all returns. Thanks for your visit & comment. I want to know if the shoes wash themselves? Did you notice in the Pumpkin Prison that two of the Purple Pumpkins have been abused? Now Pumpkins are joining the #metoo movement ! 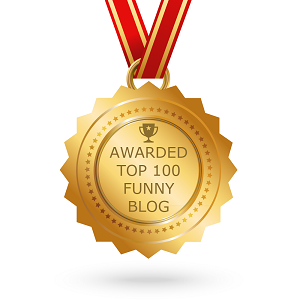 That’s funny (sad but funny)! Always appreciate your view. Keep fighting.